As JWB embarks into our 10th year in business, it is always amazing to think about how the real estate market has changed over the life of our business. We started this company in 2006 when the real estate market was red hot and properties were selling for record prices. We were in real estate in 2008 and 2009 during the crash when a job in real estate wasn’t something you’d wish on your worst enemy. True story: my business partner got pulled over for speeding in 2008 and told the police officer he worked in real estate. The police officer took pity on him and let him out of the ticket! We’ve been here the past couple of years as owning rental properties has become all the rage again as even the Wall Street crowd has joined the party. After taking part in the real estate market rollercoaster first hand over the past decade, my business partners and I quickly understood just how valuable information is when it comes to projecting where the market will be tomorrow. The great thing about real estate compared to the stock market is there are actually metrics that can indicate future price increases or decreases. At JWB, we track these metrics monthly and use them to advise our clients on future buying decisions. From 1983 – 2001, Jacksonville real estate appreciated at a rate of 3.8% per year. This was about a 20 year stretch that didn’t include the massive run up from 2001-2006. As real estate cycles tend to repeat themselves over time, JWB uses this 3.8% appreciation rate internally as our expected appreciation rate assuming we hold onto our inventory for 20-30 years. We expect that the Jacksonville real estate market will normalize itself back to that 3.8% trajectory over time. That would be the projected growth even if some of the big opportunities such as the increased shipping business to Jaxport from the widening of the Panama Canal, the exportation of Liquefied Natural Gas (LNG) or the revitalization of downtown Jacksonville didn’t happen. It would only increase if one or more of these opportunities take hold in our local economy. The way to measure this is just to expand that 3.8% growth line all the way from 1983 through today. This is your long-term growth trend line. Then, compare that with our current median home price. If we’re above our long term growth trend line, over time we are going to normalize back down to the long-term growth trend line. That would mean we should see lower than normal price appreciation. Conversely, if our current median home price is below the long-term growth trend line, then that would indicate higher than normal price appreciation. In order to get back to the normal growth of 3.8%, we need to have higher than 3.8% appreciation to get there. Where do we currently stand? Looking at the chart above, our long-term growth trend line suggests we should have a median home price of $190,000. Our current median home price in Jacksonville is $178,000. We are about 7% below today and we actually expect the growth to surpass the long-term growth trend line initially before it normalizes. This indicates higher than normal price appreciation in the short term. 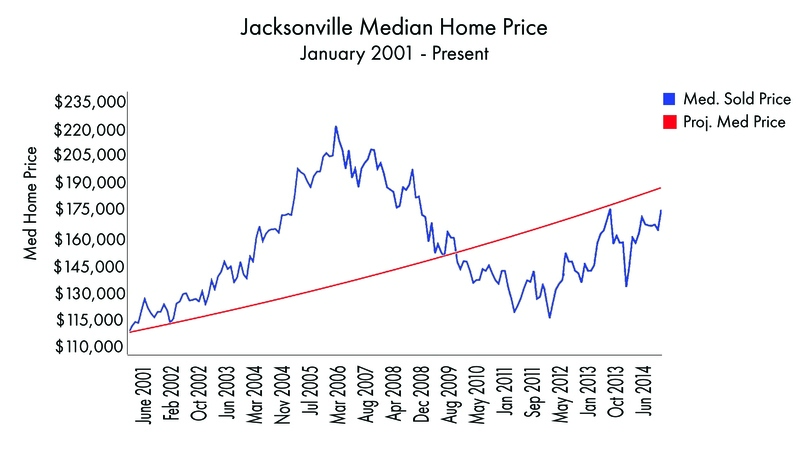 Referencing the chart above, Jacksonville’s high median home price in 2006 was $223,000. Our median home price currently is $178,000. That means we’re still roughly 20% below our pre-recession highs. There are many real estate markets across the US which have already surpassed their pre-recession highs, such as Atlanta and Memphis. You have a better chance for appreciation by investing in a market like Jacksonville which hasn’t fully recovered yet. This is another indicator for higher than normal price appreciation in Jacksonville as we ride the wave of market recovery. Months of Inventory (MOI) is another JWB favorite. This metric measures how many properties are available on the real estate market and compares it to how many properties sold last month. In effect, you are establishing a “burn rate” of all the inventory on the market. If you have a high MOI, that means you have a lot of houses that are just sitting on the market and relatively few are selling. Of course, that means you have a buyer’s market and it indicates lower than normal price appreciation. If you have a low MOI, the opposite is true. When there is limited inventory and things are selling quickly, there is upward pressure on pricing and we expect higher than normal price appreciation. In Jacksonville, an equilibrium market is defined as 6-7 MOI. For the last two years in Jacksonville, we’ve been consistently between 4-6 MOI. 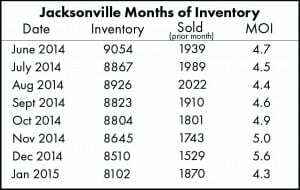 It is no wonder why Jacksonville real estate has appreciated over 16% during that time. As of January 2015, we are currently at 4.3 MOI. 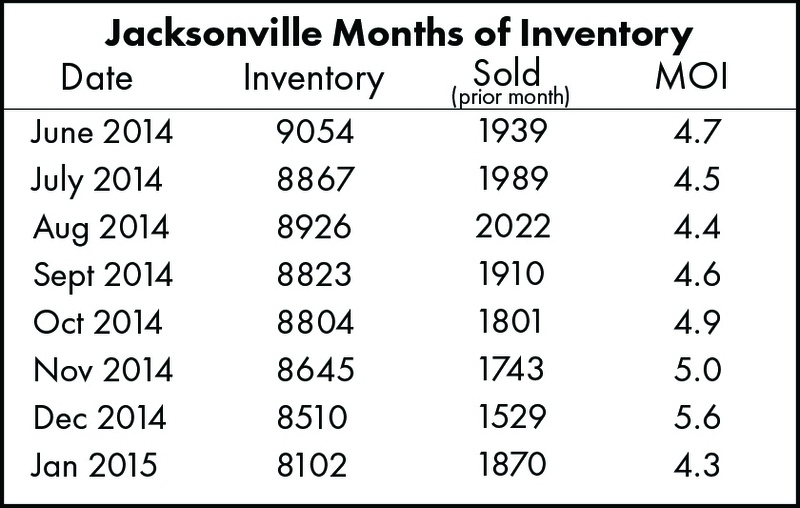 Again, this is a very strong indicator of higher-than-normal price appreciation in Jacksonville. In addition to advising our clients, we also use this information to make the best decisions for JWB’s rental portfolio. Since 2007, we have owned roughly 40 rental properties. We still own those rental properties but our own company holdings have grown to roughly 250. We anticipate adding another 180 rental properties this year to our passive income portfolio. We are only investing in Jacksonville and we are buying in the exact same neighborhoods as we recommend to our clients. Why are we doing this? We think the market is going up. Plain and simple. We’re bullish on Jacksonville. None of these metrics by themselves can paint the full picture when it comes to seeing where the market is going tomorrow. However, when all three point in a certain direction, that is when we really start to take notice. And that is what is happening today. I think people are going to look back in 3-5 years and kick themselves for not buying as much as they could during this time. If you are interested in learning more about how JWB’s clients invest in turnkey rental properties and our forward looking statements about the Jacksonville market, the best thing to do is to set up an appointment to speak with our team. Gregg Cohen is the Chief Executive Officer of JWB Real Estate Capital. JWB serves clients in 10 countries and 36 states who have invested in over 1,300 properties since 2006. JWB has been featured in publications such as the Wall Street Journal, NY Times, Fortune Magazine, and many more. To learn more our team and our investments, please call (904) 677-6777.